Mad Max meeting Royal Ascot with a light dusting of Vegas stardust comes to mind entering the G Hotel Galway wandering from a glitzy silver grey grand salon hung with two hundred enormous glass ball light installations into a lipstick pink lounge displaying Andy Warhol print fabric covered chairs. Blinking at the startling decor we stumble (literally) upon a large’ dressed to the nines’ wedding party unintentionally barring our way to the lifts. A middle aged woman wearing a sparkly couture frock, tethering on matching high heels herds a couple of mini fairy princesses (flower girls)encased in clouds of tulle. Then an elderly country man, a tweed cap planked down on his head, passed by wearing a look of quiet desperation amid such hedonistic glamour. I caught him later hidden behind the horse racing pages of a newspaper, a tad more relaxed, in the calmer environs of one of the bars decorated in rich blues, greens and black. The G (short for Galway!) dates back to the height of Ireland’s ‘Celtic Tiger’ era, a bright star in a firmament of celeb owned establishments like the trendy U2 owned Clarence Hotel in Dublin. 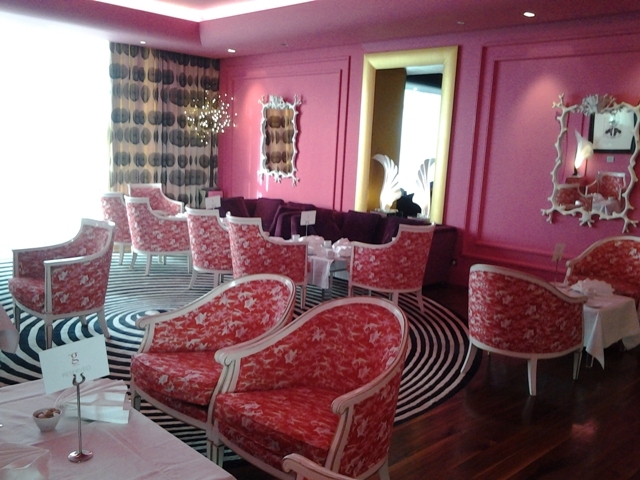 Designed by famous royal milliner Philip Treacy who hails from a small far flung Co Galway village where he honed his skills as a child dressing his sister’s dolls, the first thing to be said about the G Hotel is that it is genuinely ‘different’, as effervescent and fun filled as a glass of bubbly. With neither spacious grounds nor winding avenues and perched on the edge of the last set of major traffic lights approaching Galway city, more associated with DIY stores and carpet retailers, it’s setting is the first surprise. At the rear of the complex that houses the G we discover a branch of Woodies, a cinema, a pet shop and a couple of coffee outlets. 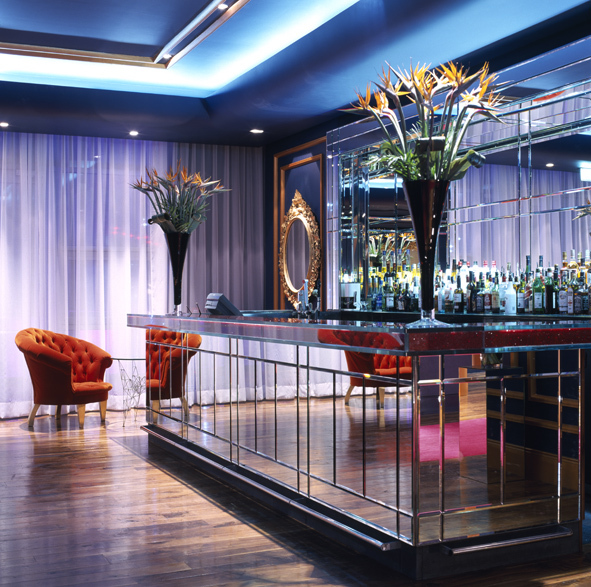 The G Hotel embraces and takes advantage of its unusual location offering a keenly priced Dinner and a Movie package targeting business that might otherwise might be shy about dining in 5 star surroundings as well as the anniversary/special occasion market. 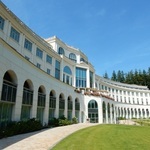 Opened back in 2005 The G survived Ireland’s downturn, continuing to appeal to the moneyed brigade as well the less well heeled with something nice to celebrate. It might be a festive fashion themed afternoon tea or a ladies day out featuring hours of indulgence in the award winning ESPA and dinner. The interior features regularly in glossy magazine fashion shoots. In contrast to some other 5 star establishments I found the G to be nicely informal and chilled. 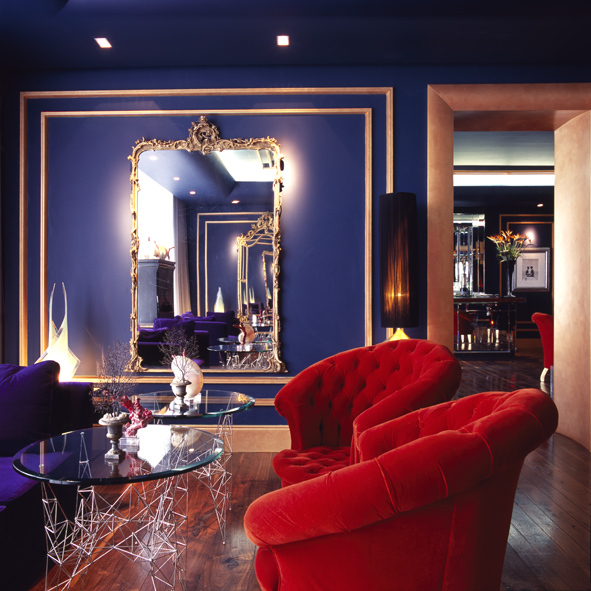 The route to our room – a dark corridor peppered with decadent reds and purples – was designed to inspire quiet!. 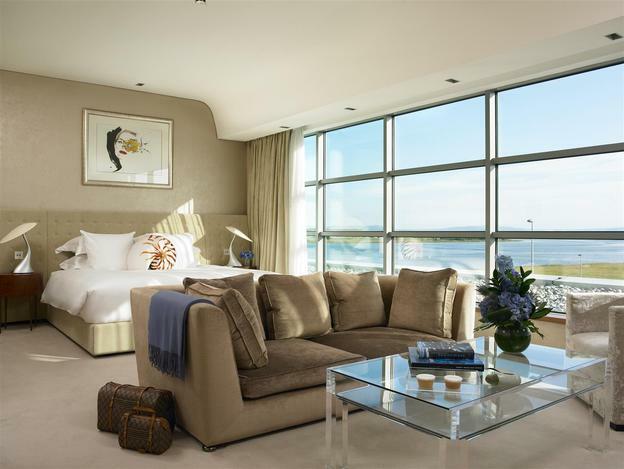 Bedrooms inspired by Philip Treacy’s vision of landscapes and seashores of Co Galway are designed with shell shapes and patterns of sand and ripples. Wherever you look, from the sweep of a door knob to the wall etchings his hats come into the picture too. The bedside lamps are modelled on Philip Treacy’s first hat designs. Cupcakes iced in cream and pink with the G motto await new arrivals to the spacious soft and seductive bedrooms. The flow of traffic that passes is silenced by efficient sound proofing and rows of bamboos and other exotic plants that screen you off from the outside world, except for upper suites looking out on the water. I spent an hour enjoying the vitality pool with its numerous aquatic massages and the tropical mist and arctic rain showers. The relaxation area looks out on a thicket of bamboo reminiscent of south East Asia. I fancied a cup of herbal tea but there was an added charge and only water came free. The G has a special suite dedicated to supermodel Linda Evangelista, friend and muse of Philip Treacy and water colours of her wearing his signature hats and head pieces adorn many of the bedroom walls. 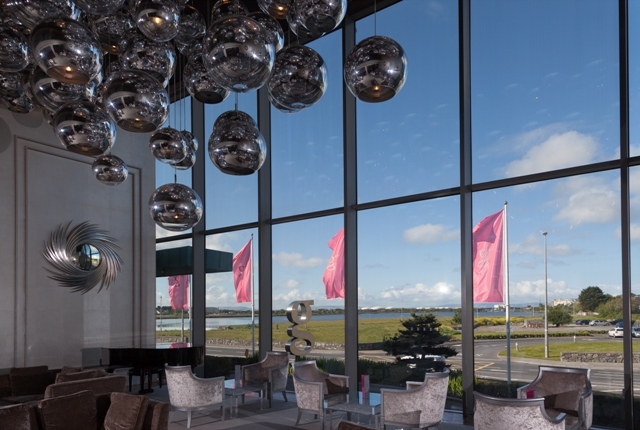 The sea – albeit a inlet of Galway Bay Lough Atalia is nearby so the whole hotel design reflects that, from the Connemara Co Galway bred rare seahorses that swim in a tank embedded in the wall of the reception area to the oyster grey wallpaper and 250 Origami birds suspended from the ceiling of the spa’s vitality pool. 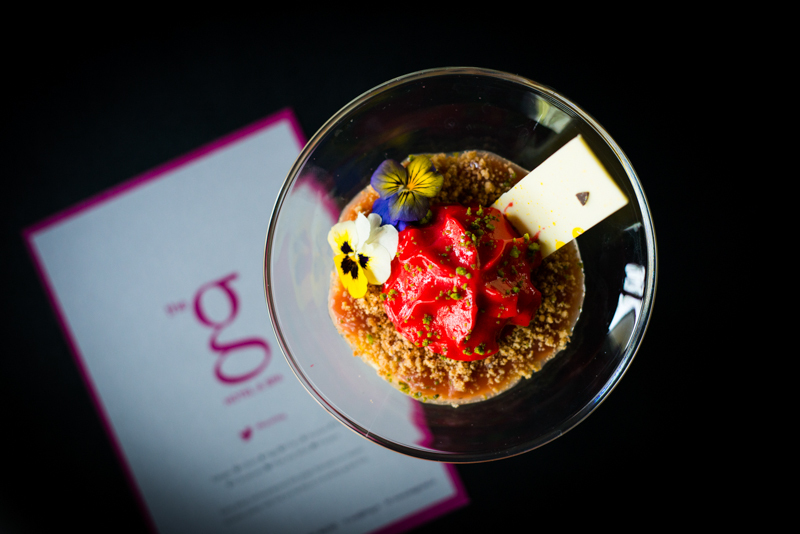 The G’s award winning restaurant Gigis offers 2 courses for £22,50 and 3 courses for £27. The kitchen is headed up by Cedric Bottarlini who is half French and part Italian and Spanish. Due to other commitments we did not dine there on this occasion but hope to do so again soon. Breakfast at Gigi’s featured traditional Irish breakfast (delicious, he said) and I opted for G style eggs Benedict, probably the best I have ever eaten from an extensive cooked to order choice. 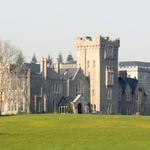 The scenic university city of Galway city is a brisk 20 minute walk from here or take a shuttle, taxi or local bus. One US reviewer raving about the G’s comfort warned “you might find it hard to leave your cocoon and discover Galway and the surrounding countryside”. But it’s well worth making the effort, especially to enjoy the bracing air along the promenade at Salthill the nearest seaside with stunning views at sunset over Galway Bay, enjoy some traditional music on Cross street at Tigh Neachtain’s or wander the famous Spanish Arch and other medieval landmarks. Galway is famous for its festivals throughout the year. 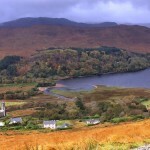 The best includes Galway Arts Festival and the Galway Races in July and the international Oyster festival in September.